I'm fudging a little calling this a book, since it first appeared in the pages of the pulp magazine TERROR TALES (in the September 1934 issue) and is available now in a partial replica of that issue. But at least it's a complete novel; the editor says so right on the...No, wait, it's more like a 25,000 word novella. But it is forgotten by most of you, more than likely, and I had a great time reading it, so I'm going to write about it anyway. Unlike most Weird Menace stories, which usually have some apparently supernatural aspect to them (I say apparently because there's almost always a rational explanation for the bizarre elements), HOUSE OF LIVING DEATH is set up more like a straight crime/suspense yarn. Two-fisted adventurer and narrator Hal Armour returns from Chile, where he's been managing his father's business interests, to New York, where his father died unexpectedly. When he gets there, he finds that the estate is being handled by a shady lawyer he's never heard of, and an aunt he didn't even know he had has come out of the woodwork, too. Naturally, all this makes Hal suspicious (can't say he's not quick on the uptake...well, actually, you can), and before you know it he's been framed for a murder he didn't commit and thrown into an insane asylum because the lawyer and the "aunt" have made it look like he's crazy. The rest of the novella concerns Hal's efforts to survive in the asylum (which is full of violent inmates, brutal, whip-wielding guards, and a doctor who's crazier than the people locked up there, of course), find out the truth about what's happened to him, rescue the beautiful blonde he meets in there who seems to be in the same fix he is, and blast apart the conspiracy and set things right. This involves lots of running around in the big, hulking building and fighting not only the head guard but also the other inmates, who really are crazy, although they've probably been driven that way by the tortures their captors have handed out to them. Zagat's prose is as breathless and over-the-top as it should be in a story like this, and he never slows down the pace long enough to let the reader think too much about how obvious the plot is. However, he does come up with a fairly nice twist along the way, and then, after what seems like a pretty apocalyptic ending, he has one more twist in store. I realize the appeal of a story like this is going to be rather limited in this day and age, but I thoroughly enjoyed reading HOUSE OF LIVING DEATH. There are several collections of Zagat's Weird Menace stories available, so if you want to check out the work of one of the top authors in the genre, I highly recommend them. Arthur Leo Zagat isn't a name I'm familiar with but those magic words "weird menace" hook me every time. I'll have to track this down. 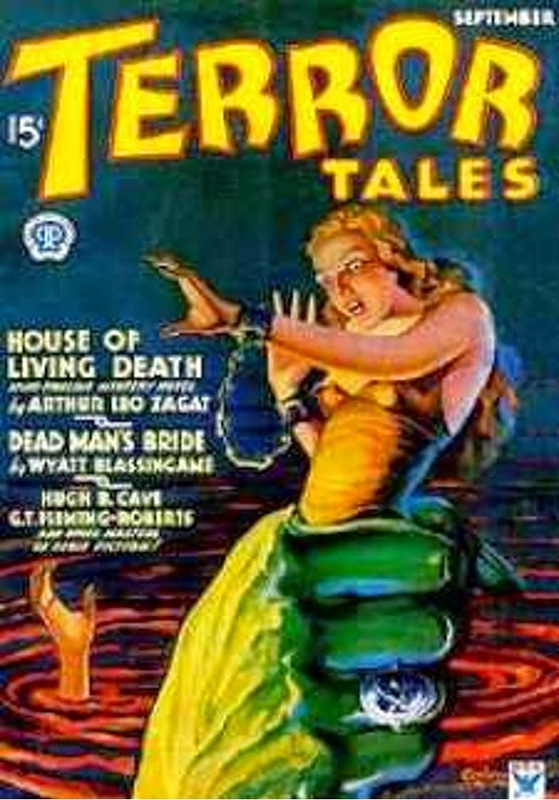 Zagat didn't limit himself to shudder, George, but if you've dipped back into shudder pulp, I'm surprised you haven't come across his work before. Zagat wrote a lot of stories for the mystery and detective pulps, quite a bit of SF on his own and in collaboration with Nat Schachner, and even a Western or two. I haven't read anything but his Weird Menace yarns, but I plan on trying some of the others. Knox was supposed to be one of the better Shudder Pulp authors, but I haven't read enough by him to say, just a story or two. I believe Zagat died in 1949. The Zagat city guides that continue today were started by him.